Following the tremendous one-off success of his club hit "I'm in the House," DJ/producer/label owner Steve Aoki has confirmed that he's begun work on a new studio full-length, which, like his first album, will feature a heavy-hitting line-up of musical guests. This time around, though, it sounds as though the guests will be featured on Aoki's tracks, rather than Aoki mixing theirs. 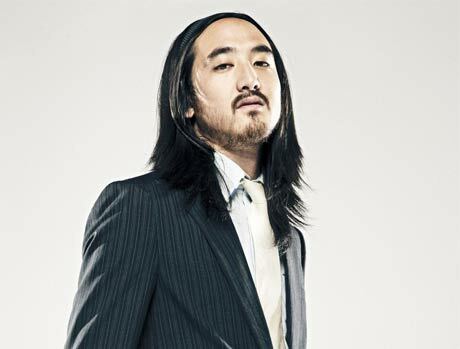 "With my album, I'm doing a couple of different tracks with some familiar voices," Aoki told MTV in a recent interview. "Zuper Blahq, Kid Cudi, Lil Jon, Weezer, Black Star, Uffie, Sky Ferreira ... just mixing it up with some hip-hop vocals, rock vocals, house vocals. So yeah, it should be interesting." He also spoke about the emergence and rise of DIY, "bedroom producers" like himself, whose interest in a multitude of genres and fun-loving scene have piqued the interest of other music lovers. "We're all doing it ourselves," Aoki offered. "We're making enough of a riot in our own world that more people are getting interested and want to get involved in what we're doing. And if it makes sense to do a collaboration with a familiar voice that everyone knows, then it can make sense on both sides. It can work on the underground and it can work in the commercial world." No release date or further details about the album have yet been released.